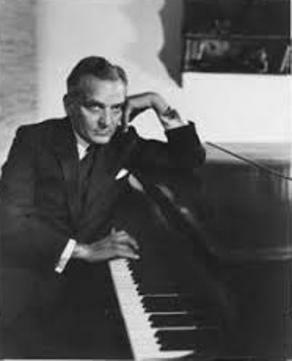 A musical prodigy by age four, Fritz Loewe was born in Berlin to Austrian parents. His father was a renowned tenor who originated the role of Prince Danilo in The Merry Widow in 1906. Raised in the Viennese operetta tradition, Loewe studied in Berlin with famous pianist-composers Ferruccio Busoni and Eugen d'Albert and composer Emil von Rezniek. At age 13, he was the youngest piano soloist ever to play with the Berlin Philharmonic and the sheet music for "Katrina," a popular song Loewe wrote when he was 15, eventually sold over one million copies. In 1924, after touring the United States with his father, Loewe chose to stay in America intending to become a concert pianist and write for Broadway. Instead, for the next decade, Loewe worked at a variety of odd jobs, including cattle punching, gold prospecting and prize fighting, as well as playing piano in German clubs in New York's Yorkville neighborhood and in movie theaters accompanying silent films. During the 1930's, he contributed music to a number of Broadway revues and shows, none of which met with much success. In 1942, Loewe approached Alan Lerner at the Lambs Club in New York to talk about collaborating on a show -- and thus began one of Broadway's most extraordinary and productive partnerships. Their first Broadway venture, What's Up?, opened on Broadway in 1943 and ran for only 63 performances. It was followed two years later by The Day Before Spring, with choreography by Anthony Tudor, which ran for 167 performances. In 1947, Lerner and Loewe had their first Broadway hit, Brigadoon, followed in 1951 by a second, more moderate, success with Paint Your Wagon which included such songs as "They Call The Wind Maria," "I Talk to the Trees," "Another Autumn" and "Wandrin' Star." Both famously had choreography by Agnes DeMille. In 1956, My Fair Lady, with Rex Harrison and Julie Andrews, opened on Broadway. Often called the "perfect musical," the show ran for 2,717 performances and the cast album sold more than five million copies. Their 1958 film musical, Gigi, won nine Academy awards, and in 1960 came their last great success, Camelot, starring Richard Burton and Julie Andrews. In 1974, Lerner lured Loewe out of retirement to work on their last venture together: a commercially unsuccessful film version of Antoine de St Exupéry's The Little Prince. The winner of numerous Tony, Academy and Golden Globe awards, Loewe died in Palm Springs, California in 1988.